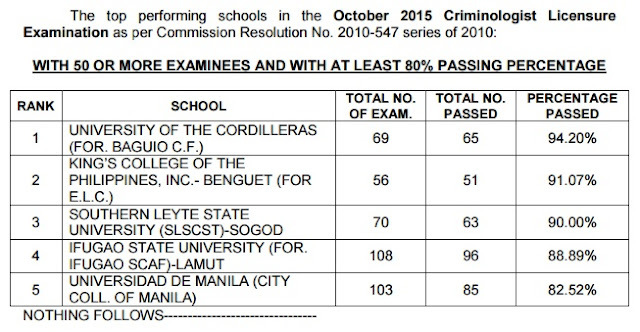 The Professional Regulation Commission (PRC) officially announced on Thursday, November 26, 2015 that 9,671 out of 29,591 (32.68%) passed the Criminologist board exam given by the Board of Criminology in the cities of Manila, Antique, Baguio, Cagayan de Oro, Cebu, Davao, Iloilo, Legazpi, Lucena, Pagadian, Palawan, Pangasinan, Tacloban, Tuguegarao and Zamboanga last October 2015. 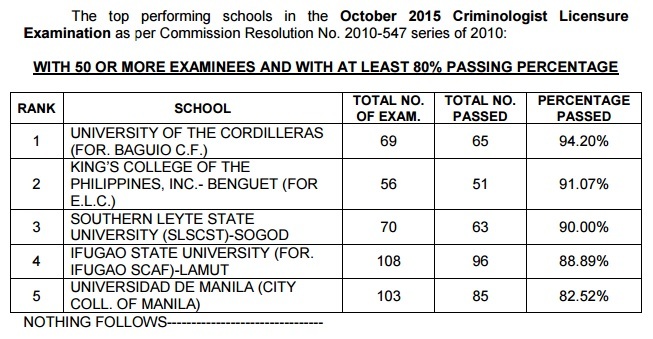 PRC named University of the Cordilleras (UC) as the rank 1 top performing school in the October 2015 Criminologist board exam as per Commission Resolution No. 2010-547 series of 2010. UC got 94.20 percent or 65 out of 69 passed the test.